Vascular anomalies encountered during laparoscopic inguinal hernia repair could be a source of significant hemorrhage. The external iliac artery normally resides within the Triangle of Doom and its injury is avoided by limiting dissection in the triangle. When the artery courses beyond the confines of the triangle it is subject to injury by injudicious dissection. We describe a series of meandering external iliac arteries discovered during laparoscopic inguinal hernia repair. Methods: A retrospective review of all laparoscopic inguinal hernia cases completed by 2 surgeons was performed. Results: 356 inguinal hernias were repaired laparoscopically over 5 years. All but 9 cases were totally extraperitoneal. During the dissection of the preperitoneal space 7 meandering iliac arteries were encountered. In 2 cases the internal iliac artery coursed medial to the Triangle of Doom and in 5 cases the artery coursed lateral to the triangle. No vascular injuries occurred and the vascular irregularity did not impede placement of the mesh prosthesis. 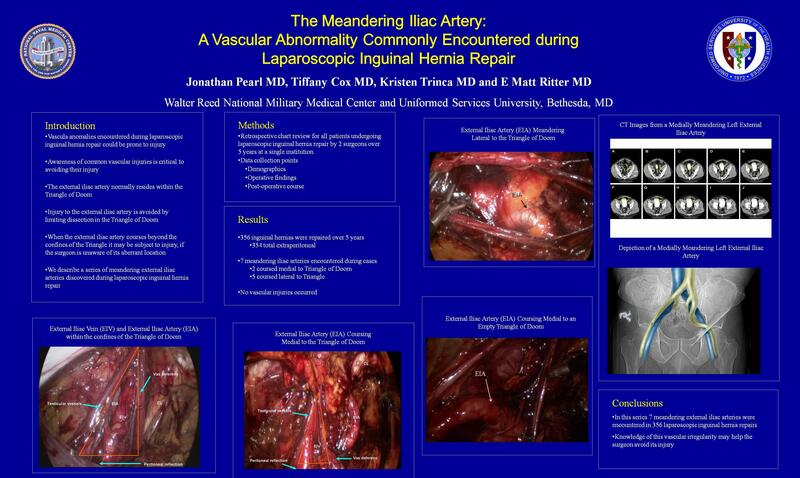 Conclusion: A meandering iliac artery may be commonly encountered during laparoscopic inguinal hernia. Knowledge of this vascular abnormality may help the surgeon avoid its injury.